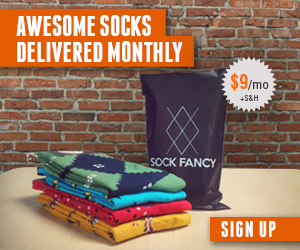 Sock Fancy bulk subscription makes a great corporate gift! We’ve written several reviews of Sock Fancy, which is one of our favorite sock subscription services. Recently, Sock Fancy also launched a corporate gifting program — quite a novel idea! A corporate gift subscription is a great way to send out office holiday gifts, impress clients with a surprise sock of the month club gift, and say thanks to team members or others who have helped you in the office environment. To buy a corporate sock subscription gift, you commit to buying a certain number of sock subscription plans based on the number of gift recipients. Based on the commitment, you receive a discount on the price. The discounts for Sock Fancy’s corporate sock subscriptions are 15% for a “Group” order (10-25 subscriptions), 25% off a “Team” order (26-50 subscriptions), and 30% off for an “Agency” order (51+ subscriptions). Sock Fancy highlights their flexibility in bulk corporate plans and encourages you to contact them for anything additional. Who else could benefit from Sock Fancy’s corporate gifts? Sports teams, religious groups, wedding parties, and more — any environment where stylish socks are important, and the fun of receiving a new pair of socks each month will keep the group delighted. 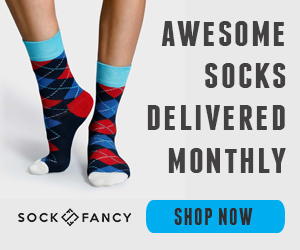 We love Sock Fancy’s free worldwide shipping on their sock of the month club — sign up today for their basic sock subscription service and see if you get ideas for a corporate gift!